Guide your classroom in an organized sequence of learning with this curriculum and lesson plan guide. 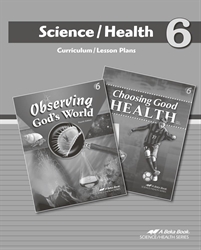 These conveniently prepared instructions will help you teach both 124 science lessons and 46 health lessons for Grade 6. Lessons direct you in class preparation, review, procedures, applications, quizzing, and homework. Visual ideas and game ideas give you extra tools to better instruct your students and keep them engaged. A Scope and Sequence for both subjects plus added Enrichment Ideas will guide you to conduct a successful class.